Ziran Zhang is an Associate Attorney at Burnham & Gorokhov, PLLC. His practice focuses on criminal litigation in state and federal court. He is admitted to practice in Washington, D.C., Virginia and New York. 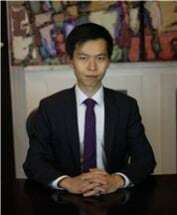 Mr. Zhang began working with the firm in 2011. He was part of the defense team that secured a verdict in favor of the defendant in a jury trial under Virginia’s Sexually Violent Predators Act, one of the few defense verdicts in the history of the law. In 2016, Mr. Zhang and Mr. Gorokhov obtained a “Not Guilty” verdict in the U.S. District Court for the Eastern District of Virginia, Alexandria Division, while representing a client charged with Conspiracy to Commit Wire Fraud and Access Device Fraud. Mr. Zhang has represented clients on appeals in the Fourth Circuit, the D.C. Court of Appeals, and the Virginia Supreme Court. In addition, he has represented clients in the U.S. District Court for the Eastern District of Virginia, and in various Virginia state courts. Prior to joining Burnham & Gorokhov, PLLC, Mr. Zhang worked as a pro bono attorney for the Central Virginia Legal Aid Society, where he represented indigent clients in civil and administrative litigation. Mr. Zhang holds a B.A. from New York University and a J.D. from George Mason University. While in law school, he completed an internship with the Fairfax County Public Defender’s Office.